The 12 channels correspond to the 5-wire load cables of the three-phase port ABC. Each load on the load cable has a corresponding LOADING LIVE, neutral, and ground. One main control board controls 12 channels to ensure that control signals can be properly distributed and transmitted to the corresponding control loop. 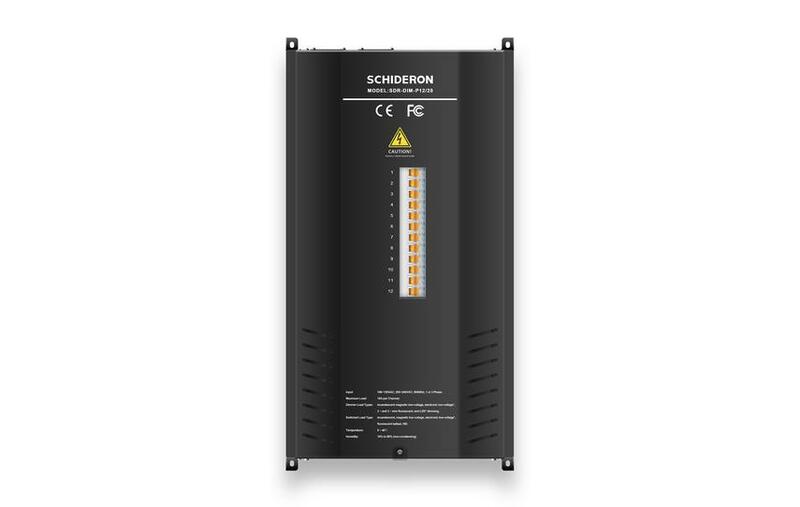 The device can be visually and centrally managed through SCHIDERON Intelligent Lighting Management System (LMS). The data of each channel in the device can be uploaded into the intelligent lighting management system for device data management and status analysis. Scene management is to preset the time to the device through the LMS, and then turn on the corresponding scene mode to reach all or part of the device loop. The device is designed for the MCU pure hardware architecture and has local data processing and channel control. The overall device power consumption is low and the task processing is timely. The device communicates via the bus to ensure the stability and reliability of data transmission. Each device has a corresponding physical address. The device's address setting can be set through the DIP dialer to ensure that each device can operate correctly and accurately receive and execute commands transmitted from the bus. The device has 3 control boards, each of which acquires a phase zero-crossing detection; the device has a total of 3 sets of single-phase zero-crossing detection circuits. The proprietary zero-crossing filter technology makes each opening/closing action of the device relay in The zero-crossing point of the frequency will extend the service life of the device, reduce the flickering of the lighting fixture, compensate the voltage and frequency fluctuations of the circuit, and in order to ensure the safety of operation, the dimmer has a separate isolator and ground. The voltage from each port to neutral must not exceed 250V. SDR-DIM-P12/20 is a 12-channel high-power SCR dimming device for electronic low voltage (ELV), incandescent (INC), neon/cold cathode (Neon/CC), and electromagnetic low voltages. Lighting fixtures such as lamps (MLVs) perform leading-edge phase dimming control. The maximum single-channel load current is 20 amps. Unlike ordinary dimming modules, professional dimming boxes require a higher level of work environment and must be ventilated and dry. When installing, there are special requirements for the connection of the device to the load and control terminals. The independent lighting control, pre-editing scene control and scene timing control can be performed through the intelligent lighting management system (LMS) visualization. The device data can be uploaded to the intelligent lighting management system (LMS) for device state management and data statistical analysis, and the entire data transmission and equipment Control meets the latest industrial industry standards.